Her impact on me: Rachael has been one of my biggest supporters since we connected through Center Square Journal. She’s a frequently comments on this blog and is a talented writer. RJ: It depends on the project. Most projects have deadlines so you are limited to how much time you have to think things through. My preferred time though is about a week of brainstorming. It is great to talk to a client, get to know them and then begin to think through their business, their needs and their style. While brainstorming a project or even a personal blog idea, you will find that the more time you have to think it through the more you can see the company/business/organization in every day life affecting you or someone you know. RJ: Notebooks – plural! I am a disorganized thought collector to say the least. I have a notebook in my purse (that is also a daytimer), a personal journal and I have a notebook at my desk. Wherever I am I grab the closest item and jot down notes. At the end of the week I collect these all electronically. RJ: Grabbing my personal journal and just letting it all out the old fashioned way – paper and pen! It has been discussed here (http://personofletters.com/2011/09/01/whens-the-last-time-you-handwrote-something/) but I find sitting down to hand write whatever is on my mind helps clear the air. I find that writers block isn’t generally a lack of ideas, but just the opposite. I have the hardest time focusing on a single project or subject when there are too many ideas floating around. Taking to my personal journal lets me put everything on paper, personal and professional. It clears the way for focus on the task at hand. RJ: This is a hard question! I am overwhelmingly inspired by writers who wear their heart on their sleeve. But I find that writing, new via blogs or old via the classics, boils down to our relationships. As a freelancer I want companies to connect with clients and as a blogger I want to encourage others in their every day life relationships. That being said I am most inspired to write by Jane Austen (Sense and Sensibility to be exact!). Austen was a women who could translate life’s relationships in regards to work, love and even spirituality into comical, serious and inspiring words that ring true even now. Herman Hesse: The Glass Bead Game (Das Glasperlenspiel) is a MUST READ for anyone that wants to understand the use of metaphor intertwined on multiple levels. This book is a challenge. Madeline L’Engle: Her fiction is world renowned, but her non-fiction is inspiring, check out Two Part Invention. Most authors are not what they appear. Henri Nouwen: A priest. A writer. A sociologist. A person of questions. Although Henri Nouwen is a spiritual guru to most, he still has more questions than answers like most of us. Check out the Genese Diary. RJ: Although I make a living as a copywriter, I am most passionate about blogging and using my story to inspire others to positive action. This is still a work in progress but right now one of my driving goals to keep writing. Hopefully my writing, whatever the platform, invokes in people a sense of self that is valuable, unique and needed in the world we live in. At one time or another, and more than writers like to admit, we get writer’s block. Being uninspired is frustrating and always seems to come at a time where it is very unwelcome. Whether it is right before a deadline or when you want to write for yourself, it’s frustrating. That’s how this post came about. My good friend and fellow blogger at Ruffly and Sweet asked me what I was planning on blogging about this week and I said that I didn’t know. She told me that is exactly what I should blog about. This is the first time that I haven’t come across an article that I wanted to blog about or have had a fabulous experience that I wanted to share for Person of Letters. I just haven’t really been inspired to write and I haven’t been writing as often. But for me, the best thing to do when I’m feeling uninspired it to talk it out, either to myself or to those around me who are willing to listen. That’s how I became inspired today. I’m the ultimate procrastinator and that coupled with writer’s block can make what I do extra difficult, but this is when I thrive. I feel my writing is best when the pressure is on and I know that I have to put my nose to the grindstone and turn things out quickly. I’ve always been this way and let’s face it; I’m not going to change. So I cope and I trudge through and I continue to write. How do you cope with writer’s block? What do you do to get inspired? 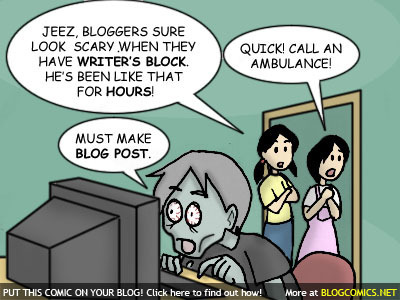 Share you suggestions for coping with writer’s block in the comments section!